First, I’ll show the sheer facts – graves with relevant grave goods, and the relative distances between the strap-ends and buckles. I have decided to keep this post purely about the graves, and not start analyzing iconography, statues or other works. The analysis will then try to show what was most likely the prevalent fashion of belt, and how likely this analysis is accurate. So, without further ado, let’s dive into the data. There aren’t a terrible lot of belt accessoire finds in Birka’s graves. 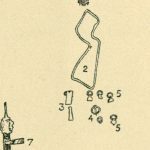 I did not research the Black Earth in this posting because it wouldn’t be very helpful – this article is based largely on in-situ grave drawings and those are naturally unavailable in the settlement finds. The belt finds from Birka’s graves are shown in Birka I: Die Tafeln, plates 86 and 87. The oriental and horse-belts are on plates 88-90. 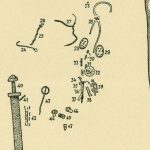 Please see the below table for a list of belt accessoire finds in Birka. The order is not random – it follows the order in Birka I:Plates. OK, it is random. Cremation graves, as it is impossible to determine the relative position of the belt buckle and strap-end to each other. Inhumation graves with only buckle or strap-end, not both – again, it’s impossible to deduce the relative positions. This reduces our table quite a lot. See below the table of all graves with relevant graves. I took most of these plans from Birka I, which is thankfully freely available as a high-resolution PDF. 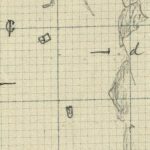 In two cases, I had to resort to Stolpe’s original pencil drawings as the printed plan was either unclear or unavailable. 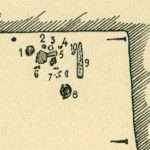 The grave plan (this is Stolpe’s original sketch) shows that the belt buckle (the item in the center-left square, topright corner) and the strap-end (lower right square) are easily 25cm apart. 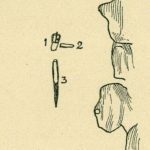 Here, the strap-end (or at least what I think is the strap-end) and the buckle are about 10cm apart, but there’s no scale to the drawing (which is, again, Stolpe’s original sketch). This grave is interesting. It’s a double grave, and both belt sets are very close to each other. The carolinigian set is numbered 44 and 45, the Borre set is 46 and 47. This could have meant that the corpses were placed one upon another – maybe the woman was sat on her husband’s lap. It’s also one of the very, very few places where there are strong indicators for a woman’s belt set. Both belt sets are silver and cannot possibly have belonged to one belt with two straps (they are stylistically completely different). The first set of strap-end and buckle, the carolingian one with the rectangular strap-end, are very close to each other, only about 5cm apart. The second set, the Borre decorated one, is futher apart – maybe 10cm. Belt and strap-end are directly adjacent to each other. 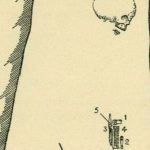 For this grave, the illustration is note very helpful, the strap-end is number 5 on the drawing. However, the text in Birka I states that „irrelevant remains of the buckle are corroded to a piece of fabric and the strap-end“. 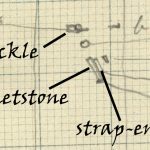 This means that strap-end and buckle were directly adjacent to each other. A rather clear-cut case: belt buckle (9) and strap-end (8) are almost on top of each other. What looks like another strap-end, number (6), is actually a whetstone. About 8cm distance between buckle and strap-end. Buckle and strap-end are directly adjacent to each other, maybe 5cm distance (assuming that the strap-end was flipped over during composition, and measured from its lower end). Analyzing the information above comes with several caveats. The position of items in inhumation graves can vary substantially from the placement at the time of the burial. This is due to the decomposition process of the body (which includes gases, flattening of the soft tissue, and induces considerable movement), but also geological phenomena, grave disturbance by robbers, animals or new burials (re-usage of grave space was not uncommon in Birka). This means that the following analysis should be taken with a huge grain of salt. Looking at the numbers, there is only one clear case for a „long, dangling belt“, and that’s grave 478. The others have distances that are more in line with modern belt fashion – 10cm seems to be a maximum of the belt end’s length. However, it’s (at least for me, as a layman) hard to analyze how much of this data is based on movement, but I’ll try to theorize a little. Please bear with me, it’s going to be a little macabre. If a body is placed in a coffin grave (which was the prevalent measure of inhumation in the graves we are looking at right now), I think the following will happen. The coffin creates an empty, air-filled space between the corpse and the soil, which facilitates decomposition. When decomposition sets in, the body will first become bloated due to the corpse gases. A belt will bear the brunt of this bloating (if it was properly closed during burial), and either be torn open or stay closed through this phase of decomposition. If we imagine a belt with a long strap-end, where would that strap-end be placed during burial? Either on the thighs or on the hip, parallel or on top of the belt, just much left to it (near the hip bones). If the body gets bloated, I cannot imagine a way that would shift the belt buckle and strap ends towards each other. I assume that they would rather shift away from each other (the strap-end would slide off the now bloated belly while the buckle would be held in place). After the body and the garments are decomposed into a skeleton, eventually the (also decomposing) wooden coffin would break down and soil would cover the remains. During that phase, and during animal burrowing, the strapend and buckle could hardly be pushed closer together, as they are on the same horizontal plane already. This is purely speculation though, I am not a pathologist. If we stick to the pure facts, i.e. 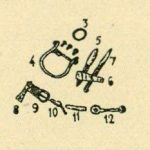 the grave illustrations, there can, in my opinion, only be one result: Belts in Birka were not work with long, dangling strap-ends knotted in the „reenactor’s knot“, but very similar to how we wear belts today. They would allow for some gaining or losing weight, thick or thin garments, but not have a reserve of 30-40cm between the buckle and the strap-end. Therefore, I think that the reenactor’s fashion of having a strap-end dangling down the leg is, at least for Birka, not based on the facts that we have, as scarce as they may be. Dieser Eintrag wurde veröffentlicht in Sonstige Ausrüstung und verschlagwortet mit belt, Birka, buckle, reenactor's knot, strap end von arnulf. Permanenter Link zum Eintrag.